David Milarch is the subject of the book, The Man Who Planted Trees, authored by NY Times science writer Jim Robbins in 2012. My brother Jon and I, having read about David, were pleased to meet him and his two sons, Jared and Jake, at their nursery in Copemish, Michigan in 2012. David’s organization, Archangel Ancient Tree Archive, has the mission of working with the oldest, largest, and most iconic ancient trees to archive their genetics and replant their clones to solve the worst environmental problems the world faces. We were impressed at what they were trying to accomplish and how far they had come. Now, four years later, they are still avidly pursuing their dream and reaching a global audience. Hopefully you will become a fan of theirs as well. 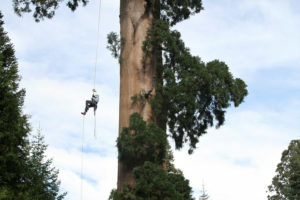 During the 10 days May 21-30, 2016, David Milarch and Archangel will be leading a group of professional tree climbers on an expedition to collect genetics from some of the oldest, largest, and perhaps most important trees on earth – the coast redwoods and giant sequoias. 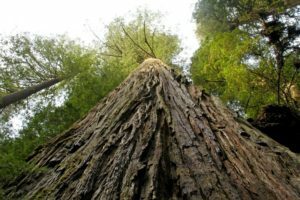 After they collect the genetics from some of the oldest trees on the planet, they will travel to northern California and southern Oregon to plant a grove of hundreds of Archangel Champion trees – saplings that have previously been collected and propagated. I have the great fortune of being able to accompany them on this expedition as a guest. Check out the Expedition Blog page and you will be able to find daily updates and photos of this expedition as it happens. Also check out the 10-minute Moving the Giants: An Urgent Plan to Save the Planet video below that captures the essence of what Archangel is about.